LEAD A FULLER, RICHER LIFE WITH LESS STUFF. When you think of what it will take to clean your house, are you so overwhelmed you throw up your hands and cry, 'It's all too much'? If somewhere along the way you've simply lost the ability to keep your home organized and clutter-free, then It's All Too Much has the solution you've been searching for. 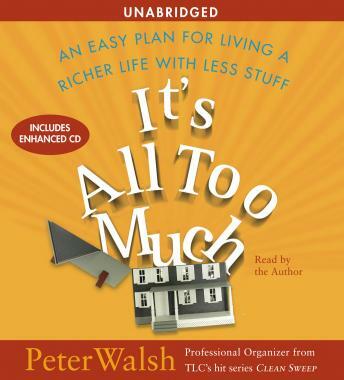 Peter Walsh, the organizational guru from TLC's hit show Clean Sweep, shares his proven system for letting go of your emotional and physical clutter so that you can create a happier, more stress-free home and life. With his trademark humor and insight, Peter guides you step-by-step through the very charged process of decluttering your home, organizing your possessions, and reclaiming your life. Going way beyond color-coded boxes and storage bin solutions, It's All Too Much shows you how to reexamine your priorities and let go of the things that are weighing you down. Filled with real-life examples and advice for homes of all sizes and personalities, It's All Too Much will set you free from the emotional baggage that goes along with clutter. At last, here is a system for managing your clutter, regaining control, and living the life you imagine for yourself.